By reaching new audiences without sacrificing artistic integrity, the festival solves a conundrum facing classical music organizations across the country. For decades, classical music—like the novel, or painting—has been dying a long, slow death that never seems to come to pass. In recent years, symphony bankruptcies, musician strikes, and opera company closings have helped amplify anxiety surrounding classical music’s presumed demise. Classical music patrons and administrators agree that there is a need for new ideas around outreach and audience development. What remains elusive, however, is a format that can broaden orchestral organizations’ reach, while expanding artistic integrity. The Dallas Symphony Orchestra may have stumbled on such a format with Soluna, a three-week, multidisciplinary arts festival that will stage its fourth installment May 6–28. When Soluna launched in 2015, it was a direct response to a DSO board edict to reach a younger audience. The result was a messy coagulation of concerts, art exhibitions, and co-branded events that didn’t really gel. Organizers stepped back and recalibrated their approach, and, over the past two years, Soluna has evolved into a curious creative creature, a cross-disciplinary smorgasbord that mines surprising common artistic ground from a disparate but intriguing array of participants. An interactive art and sound installation by Israeli artist Naama Tsabar, which debuts May 11. Soluna is a festival where Israeli artist Naama Tsabar, hip-hop legend Nas, UT Southwestern doctors, and Wagner’s great-great-grandson can appear on the bill and the mash-up doesn’t feel forced. That’s because, at its core, the programing around Soluna engages with ideas about how music, art, science, and life share common roots or mutual inspirations. 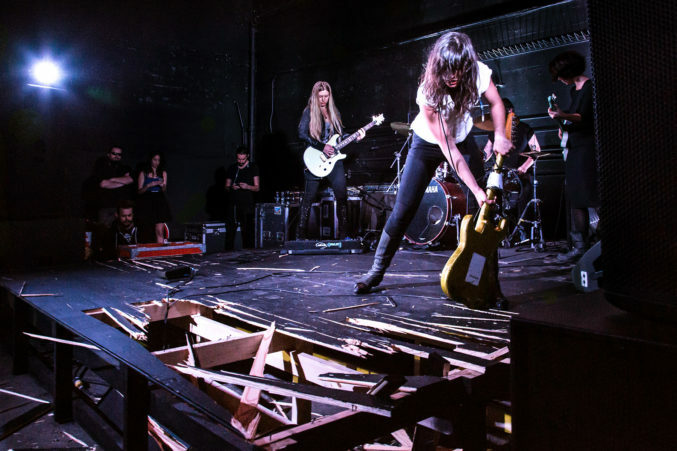 Tsabar’s installation, for example, will fill the Meyerson Symphony Center with an interactive sound installation consisting of dismantled and reconstructed electric guitars and piano strings. The festival’s Array program, which will take place at The Bomb Factory and Canton Hall in Deep Ellum, accomplishes the symphony’s desired goal of expanding its reach outside of the Dallas Arts District, while simultaneously and thoughtfully blurring tired distinctions between high and low cultural expression. Since the Arts District opened in 2009, the city has wondered about the possibilities created by collecting all of its major arts organizations into a single area. Soluna is one answer. It is a festival that uses geography as an excuse to cross-pollinate artistic missions. The DSO understands this potential. Kim Noltemy, the symphony’s new president and CEO, says there has been some discussion on the board that Soluna could grow into a SXSW-style expo. I’d say it would be better for the board to stop looking down I-35 and instead recognize the benefit in allowing the continued evolution of what it already has: something unique to Dallas and unique in the world of classical music.